Whimsical, colorful, delicate yet durable--the art reflects the man. Cooper fashioned this Brass Seder Plate. Each of the six food items to be arranged on the plate has special significance to the retelling of the story of the Jewish Exodus from Egypt, which is the focus during the Passover meal. throughout high school, with all of the art classes he could take. Each one made him realize that what he wanted to be was a metal craftsman. His search for the right college in which to pursue his passions led him to Rochester Institute of Technology (RIT) and its School for American Craftsmen. 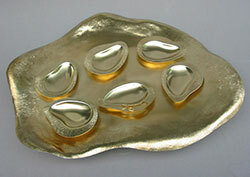 Here he had the privilege of studying under Hans Christensen, one of the finest silversmiths of all time. Encouraging clean design and a reason for everything remains Steven Cooper's modus operandi. “Never add anything that doesn't belong,” mentor Christensen would say. Thirty years later, those words echo for Cooper whenever he designs. After receiving his degree from RIT, he continued his education at Fashion Institute of Technology, where he learned from some of the industry's greatest designers, affiliated with Tiffany and Harry Winston, as well as freelance designers who created for all levels in the jewelry industry. 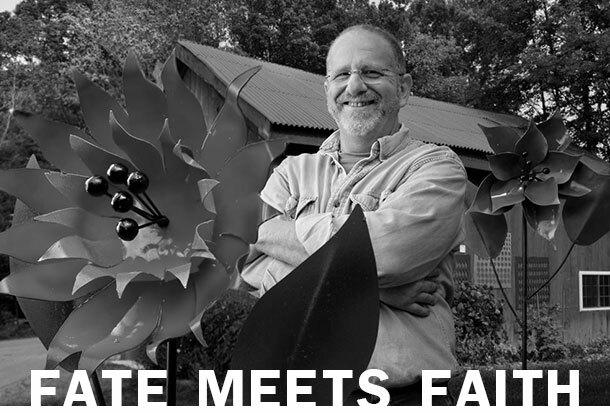 Today Steven Cooper is producing timeless jewelry, Judaica, and garden sculptures from his 200-year-old renovated barn in New York's Hudson Valley. Cooper's inspirations are from the natural world that surrounds his home, where you'll find him working, not adding anything that doesn't belong. 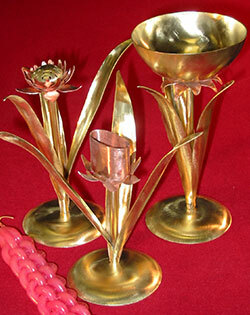 The Bronze and Copper Havhalah Set is used in a sacred ceremony observed at the end of Shabbat, in order to mark the distinction between the departing sacred day and the upcoming ordinary weekday.